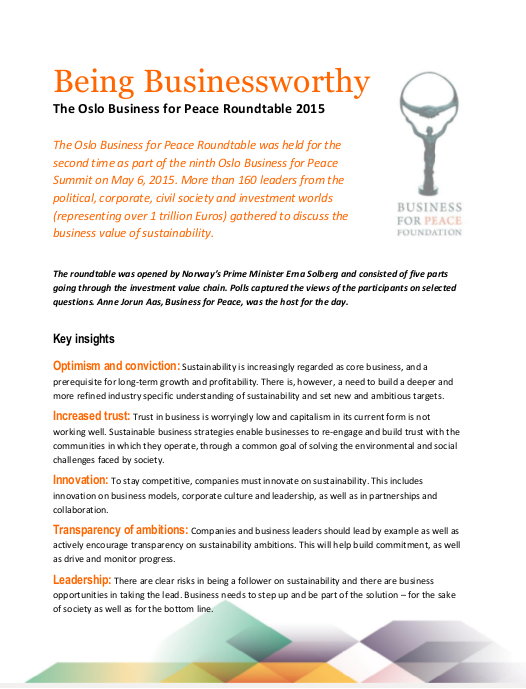 The Business for Peace Summit is a two-day event that has rapidly gained recognition as one of the world’s foremost meeting places for leaders who seek to develop business models that create both economic and societal value. 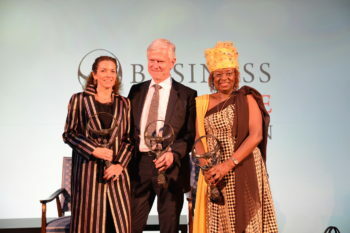 The highlight of the Summit is the Award Ceremony, where the winners of the Business for Peace Award are celebrated at the historic Oslo City Hall. The 2016 Award Ceremony featured performances from exciting young artists, a keynote address from UNDP Administrator Helen Clark and was attended by HRH Crown Prince Haakon and distinguished leaders from business, academia, government and civil society. A key component of the Summit was the Business for Peace Roundtable, which brought together almost 200 board chairs, CEOs and leaders of international organisations to discuss the practical actions needed in order to make substantial, business relevant progress on sustainability. The theme for the 2016 Summit was Moving towards the Global Goals: Business as a Problem Solver. Speakers included John Elkington (Executive Chairman, Volans), Petter Furberg (CEO, Telenor Myanmar), Helene D. Gayle (CEO, McKinsey Social Initiative), Tore Hattrem (State Secretary, Norwegian Ministry of Foreign Affairs), Lise Kingo (Executive Director, United Nations Global Compact), Jane Nelson (Director of the Corporate Social Responsibility Initiative at Harvard Kennedy School), Lady de Rothschild (Chairman & Co-Founder, Coalition for Inclusive Capitalism; Chief Executive Officer, E.L. Rothschild), and Keith Tuffley (Managing Partner & CEO, The B Team). Please click below to see the full program of the 2016 Summit.